TMJ is an acronym for temporomandibular joint. 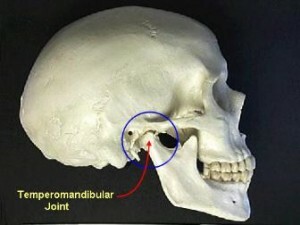 The temporomandibular joint connects the lower jaw to the temporal bone at the side of the skull. This joint is essential to daily jaw functions such as opening and closing your mouth, chewing and speaking. It also enables the jaw to slide forward and backward. It has become common for people to refer to pain in the temporomandibular joint as “TMJ” (“I have TMJ!”). In reality, TMJ is the name of the joint, not the pain. Pain in this joint is really called TMD (TemporoMandibular joint Disorder). TMJ disorder refers to any condition that impairs or causes malfunctioning in the opening or closing of the mouth. This condition can be caused by overwhelming pressure applied during normal chewing or simply a nervous tic. This damages the structures and their surroundings and leads to acute or chronic inflammation of the temporomandibular joint. This can result in significant pain in the jaw area, jaw muscles, side of the head, back, front of the neck, and sinuses, as well as impairment of motor functions. Fir proper treatment of TMJ disorder, there is no replacement for seeing a professional North Miami Beach / Miami TMJ treatment specialist trained to treat TMD, like Dr. Edderai. We currently incorporate the latest diagnostic equipment and available treatments for the varying causes of TMJ Disorder and would be delighted to discuss them further with you during your dentistry consultation. To learn more about the tools and techniques we use to diagnose and treat click on the links below. Our TMJ patients come to us from Miami Beach, North Miami Beach, Miami, Bay Harbor, Aventura, Ft. Lauderdale and Hollywood.